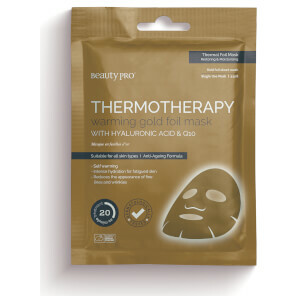 Reveal a youthful visage with the BeautyPro Brightening Collagen Sheet Mask with Vitamin C; an anti-ageing treatment that is suitable for all skin types. The intelligent sheet mask sits closely on the contours of the face, delivering a cocktail of anti-ageing ingredients directly to skin. 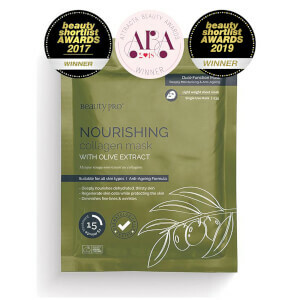 Soaked in Marine Collagen, Vitamin C and an array of herbs and botanicals, the face mask combats fine lines, wrinkles and pigmentation, reducing their appearance to reveal a youthful and radiant complexion. A dull complexion is instantly transformed, leaving skin enviably bright in just fifteen to twenty minutes. Expect a touchably soft and supple complexion that is smooth and energised. 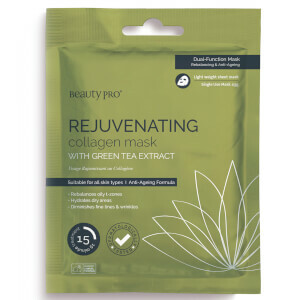 Reinige deine Haut mit der BeautyPro Detoxifying Mask. Dazu die Maske aus der Verpackung nehmen, auseinanderfalten, auf das Gesicht legen, 15-20 Minuten einwirken lassen und dann entfernen. Die Haut muss nicht abgespült werden und überschüssiges Serum kann in den Hals und das Dekolleté eingearbeitet werden. 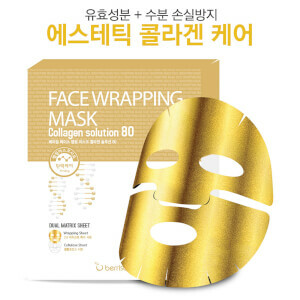 Key Ingredients: Marine Collagen, Vitamin-C, Aloe Vera, Extracts of Bearberry, Licorice Root, Portulaca Flower, Sophora Angustifolia Natural Plant Extract, Chamomile, Boswellia Serrata Plant Extract, Pomegranate, Witch Hazel.